Hamsters are small rodents that thrive on a variety of plant-based foods and specially formulated pellets. These little companion animals also enjoy many types of seeds, and benefit from the vitamins, minerals, healthful fats and nutrients they contain. When fed in moderation along with a variety of fruits, grains, nuts and vegetables, seeds are tasty treats for hamsters that help provide balanced diets. Sunflower seeds are a popular choice for hamsters, whether given as treats or mixed with other types of food. A good source of necessary fats and vitamins, sunflower seeds are an important part of a balanced hamster diet when provided in moderation. Too many, however, can cause excessive weight gain from the high fat content and diarrhea because of their vitamin C levels. When they are mixed with alfalfa pellets or given with as a snack, hamsters will benefit from the addition of these seeds to their diets. In addition, the crunchy outer shells of sunflower seeds give hamsters opportunities to hold them and work them with their teeth, an activity that is not only enjoyable to these small companion animals but necessary to keeping their teeth healthy. Many hamsters, especially larger varieties, enjoy the substantial size of pumpkin seeds. With their hard shells and large kernels, a few of these hardy seeds go a long way when mixed with hamster pellets or given as treats. Like sunflower seeds, pumpkin seeds also contain many nutrients that can balance hamster diets. However, smaller hamsters, such as dwarf varieties, may have a harder time eating these larger seeds. Additionally, dwarf hamsters are more likely than larger hamsters to become overweight and develop diabetes. Therefore, pumpkin seeds should be given to these tiny rodents with caution and in moderation. Mixed seeds that are readily available at pet stores are also great options for hamsters. Formulated specifically for hamsters' dietary needs, these seed mixtures contain an appropriate combination of large and small seeds along with pellets and grains to help ensure a balanced diet. Pumpkin, sunflower, flax, sesame, wheat seeds and corn kernels are commonly found in these mixtures that are packaged specifically for the nutritional needs of these companion rodents. Though hamsters benefit from small and large seeds in their diet, it is vital that they are provided only in their raw forms or in mixtures formulated for hamsters. Feeding seeds that are packaged for humans can lead to health problems like obesity and diabetes in hamsters, because additives such as salt and sugar are often present. Though fruit is good for hamsters, many types of fruit seeds can also be harmful or even toxic to these tiny animals' systems. Apple and pear seeds contain cyanogenic acids that can be lethal if eaten. The same is true of the pits of fruits, including cherries and apricots. The oils and extracts in grape seeds can also be damaging to these tiny pets' sensitive systems. 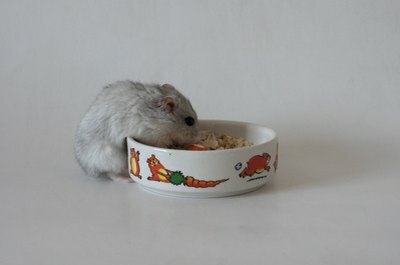 Hamster Club: A Hamster's Diet: What Should I Feed My Hammy?